All of my mother’s cooking depended on her mood, which meant delicious when she felt kindly toward the idea; not so good, possibly terrifying, when she felt forced into the kitchen, which rarely happened mainly because no one wanted that experience. I believe she inherited that attitude from her mother. My Grandmother Grace could create one of the most delicious pots of Chicken Gumbo ever to grace, pun intended, a southern table, but expect burnt crusted, interior bleeding when it came to fried chicken. She could also massacre pork chops and steak and do not even mention eggs unless you want yours over hard and crisp. Once as I watched Grace making gravy, which always tasted burnt like the chicken, a bowl of sugar fell from a shelf above the stove and landed in the skillet. “Oh, well,” she said, removing the bowl and stirring the spilt sugar into the gravy, “no one will notice.” Of course, they did, but no one dared say a word. The cooks in the family included two of Grace’s daughters, Roberta and Myrtle, and two of her daughters-in-law, Jean and Polly. These four women manned the kitchen at family gatherings that happened nearly every Sunday when I was growing up. The fare might include: fried chicken, Aunt Roberta’s specialty; ham baked with a glaze of honey and Heinz® 57 Sauce, Aunt Polly’s treat; always an array of flaky-crusted pies and light and fluffy cakes, Aunt Jean’s contribution; a variety of salads, generally furnished by Aunt Myrt; plus mashed potatoes and gravy, green beans (cooked with bacon until mushy); or other vegetables depending on the season. 1. Heat the oil in a 3-quart saucepan until smoking and hot. Add thighs, skin-side down and fry until crisp and brown, 4-5 minutes per side. Add water, bay leaves and parsley. Bring to boil, lower heat and simmer 30-45 minutes. 2. Remove thighs to a plate and set aside. Pour broth through a strainer lined with cheesecloth, skim off any excess fat and set aside. You should have about 5 cups of broth. If not, add enough water to make 5 cups. Note: At this point, the broth and thighs can be stored in the refrigerator for several hours or over night. 1. Place the flour in a bowl and make a hole in the center. 2. 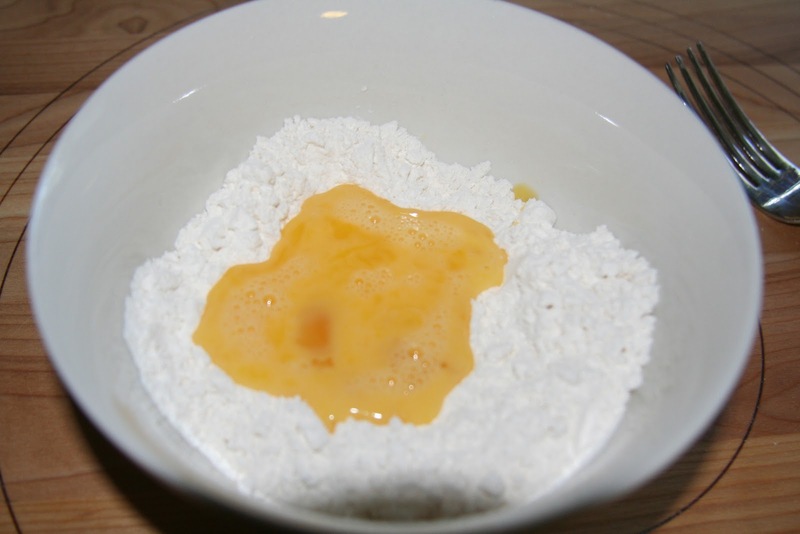 Pour the egg into the hole and using a fork, mix until flour and egg come together. 3. Scrape from the bowl onto a floured board and knead, adding enough flour to make a stiff dough. Do not over knead. 4. 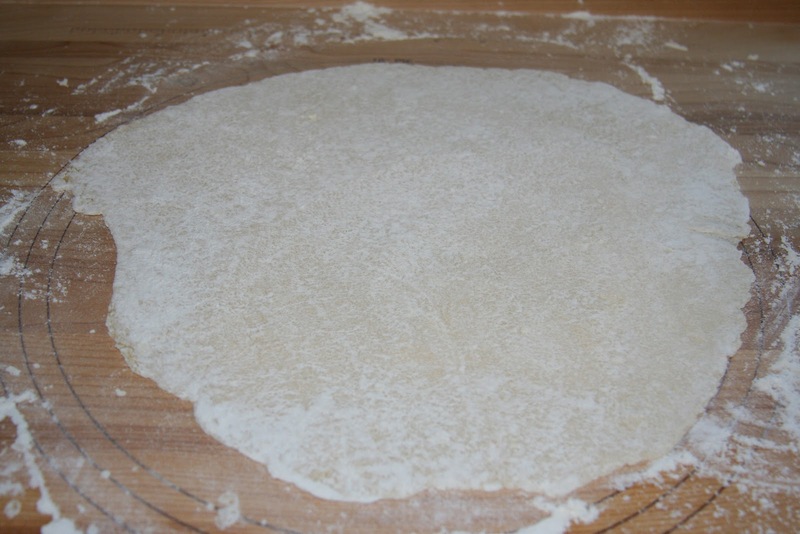 Roll out to a thickness of 1/16-inch (the thinner the better), using flour as needed to keep the dough from sticking to the board and rolling pin. 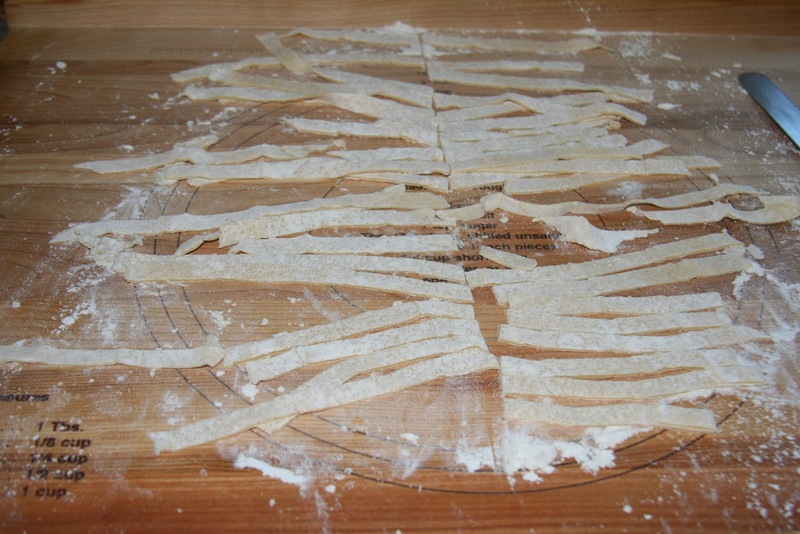 Allow to dry uncovered 10-15 minutes before cutting the noodles. 5. To cut the noodles, roll into a tube and, using a serrated knife, cut across the role at ¼- ½-inch increments, depending on whether you prefer narrow or wide noodles. Unroll each section and lay on the cutting board to dry another 10-15 minutes. Note: You can also cut the long strips into pieces if you prefer shorter noodles. 6. While noodles dry, make the soup. 1. Heat oil in saucepan over medium-high heat. Add vegetables and sauté until soft, 5-6 minutes. 2. Add reserved broth to the saucepan, bring to a boil, reduce heat and simmer until vegetables are soft, 20-30 minutes. 3. Meanwhile, remove skin and bone from chicken thighs and cut meat into bite-sized pieces. Set aside. 4. Bring the soup to a full boil and stir in the noodles. Cook at full boil until done, 8-10 minutes. 5. Add the thigh meat, season with salt and pepper to taste and heat through, 4-5 minutes. Serve and enjoy. Note: Notice that I do not add salt until the end to prevent over salting. Lovely. I'm looking for some comfort today.